Not to be confused with Conan the Adventurer (1992 TV series). Conan The Adventurer is a weekly one hour American television live action-adventure series. It was produced by Max A. Keller and Micheline Keller from 1997 to 1998 and loosely based on the fantasy hero Conan the Barbarian. The TV show premiered on September 22, 1997. It comprised 22 episodes and was filmed mainly in Puerto Vallarta, Jalisco, Mexico. The series has reached many countries of the world, more than 150. Keller Entertainment Group, the same production company responsible for the series Tarzan: The Epic Adventures and Acapulco H.E.A.T., continues to market and distribute the series worldwide and the series has longevity among international broadcasters and DVD aggregators. The role of Conan was played by Ralf Moeller (AKA Rolf Muller), two time Mr. Universe, a native of Germany, and friend to Arnold Schwarzenegger. The rest of the ensemble cast included Danny Woodburn (Otli), Robert McRay (Zzeben), T.J. Storm (Bayu), Aly Dunne (Karella), and briefly, Andrew Craig (Vulkar). The script for the 2 hour pilot was written by Steve Hayes, the head of Project Development for the series. The show was not promoted to be "authentic Conan", but rather a mixture of Arnold Schwarzenegger's and John Milius' interpretation of Conan. Indeed, the storyline deviated from the essence of the Conan character, as well as that of the Conan earlier depicted in the various Conan comic book series by Marvel Comics, because the adaptation was too peaceful and childish. An all-powerful sorcerer, the great Hissah Zuhl (Jeremy Kemp) places Conan's homeland of Cimmeria under his iron rule and controls these lands through magical arts, trickery and threats. He is responsible for the death of Conan's parents, and he is recurrent as the always just barely thwarted mastermind enemy. Conan and an army of warriors rebel and fight to free Cimmeria from the demonic tyrant and his minions. In his travels, Conan will battle fierce mythical creatures that roam the land. The hero has been chosen by the gods to fight evil, he has been informed by Crom that he is destined to be a king. Conan wants revenge against Hissah Zuhl (in all episodes the enemy has a primary role and also has a servant, a skeleton with clairvoyant powers), that constantly seeks to kill the hero. The weapons that the sorcerer uses are an apparently endless horde of warriors, as well as vassal wizards and princes under Zuhl's control. 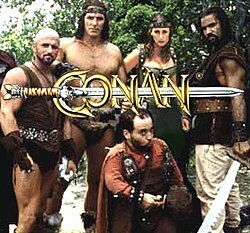 Conan's troop (all of whom are entirely or effectively unique to this television show) most consistently is made up of Woodburn as the clever dwarf Otli, T. J. Storm as the animalistic capoeira warrior Bayu, and Robert McRay as the mute staff-wielder and wrestler Zzeban who communicates in sign language. Another character is Karella, a beautiful bandit-queen, with which Conan has a fiery and sometimes conflicting passion, a love/hate relationship that causes considerable trouble for the hero. Unlike the character of Howard, who is cruel, solitary and aggressive, in this live-action adaptation, Conan is a kind, sympathetic and jovial person. He is a contented member of a merry band of adventurers with a humanitarian quest. The overall theme is that Conan is a deeply honorable man – and is pushed to a comparative extreme. The series further contrasts with the original stories in that it does not include the villain Thoth-Amon nor the evil god Set, and in that Hissah Zuhl is not based on Thoth-Amon but rather on the villain in the original "The Tower of the Elephant" Howard short story (the general plot basis for the first two episodes of the television series). The nature and scope of Conan's adventures are sharply limited in the television series compared to the comics and original stories (in which Conan had many occupations all over the then-known world, and many sets of clothing), as the TV Conan has a single-minded purpose (defeating Hissah Zuhl and freeing the people enslaved by him), rarely strays far from Zuhl's territory, always wears little but a loincloth, and in virtually every episode he and his band are wandering in the wilderness until either attacked by Zuhl's minions and going to a small village afterward, or going to a small village initially, only to be set upon by Zuhl's minions. On the spiritual level, Conan's Cimmerian deity Crom in this version is not a remote, unseen god as in previous storylines, but an accessible deity who at times provides Conan direct divine assistance, and Conan is outright devout in his worship of Crom (while in previous incarnations, Conan has little faith in gods, and believes that Crom simply observes as men struggle). Minor points of continuity between the original stories and the television series occur, especially placenames, such as Cimmeria, Conan's birthplace, and Shadizar, "the City of Wickedness" (however, most other placenames, and almost all character names, were simply invented for the TV show). The Serpent Men of Thoth-Amon in the original stories appear, but later, as minor, one-off enemies, and as servants of Hissah Zuhl, in the episode "The Taming". The quasi-Howardian Red Sonja character has a prominent but one-time role in an eponymous episode. In appearance and style, the TV show depicts Conan like that of the films, including brown (rather than black) hair, a Germanic accent, costuming and a sword nearly identical to the filmic versions, signature sword moves from the films, jewelry in the form of an eight-spoked wheel, and other cues from the Schwarzenegger portrayal of the character, as well as an opening credits logo based on that of the films. Another point of partial continuity with the comics is Conan's frequent spoken comment that he does not like magic; this was often expressed aloud in the comics but was usually unspoken in the Howard books. The she-bandit character Karella is based on the "Queen of Pirates" Bêlit of the original Conan stories, and the thief Valeria of the Conan films, herself based largely on both Bêlit and the Red Sonja character of the Conan comics (yet further based on another Howard character, Red Sonya, unconnected to the original Conan stories). The show's Karella and Red Sonja characters are sufficiently different to avoid viewer confusion, as the brigand nature of Karella (inherited from the Bêlit character) is juxtaposed with the TV Sonja's duty as a holy warrior for a sect known as the Truth Keepers, and Karella is a brunette like Bêlit while Red Sonja is a redhead. Karella also appears in several of Robert Jordan's Conan Chronicles, nicknamed "The Red Hawk". As with Subotai and The Wizard in the 1982 film, the other characters in the series are basically whole-cloth inventions for the production at hand and bear little resemblance to characters from early Conan media. Otli the dwarf in particular is entirely out-of-character for Conan as a companion (though is the provider of comic relief at the expense of other characters). As in all previous variants of the Conan franchise, beautiful women – as strong, Amazon-like warrior women in skimpy outfits, damsels in distress, or scheming femmes fatales – figure in the plot in every episode. Points of moral and ethical message similarity between this depiction of Conan and his fictive world and the other depictions (as well as many other works of fantastical fiction and mythology in the West) include consistent themes of the value of human freedom, the importance of honor and loyalty, justice through victory, the use of (righteous, not wanton) violence as a means to justice and freedom, the value of friendship and trust, the idea that bad things come to those who dabble in evil, and the possibility of redemption for past wrongs for which reparations are made. On September 21, 2004, Image Entertainment released Conan the Adventurer: Complete series on DVD in Region 1. ^ "image-entertainment.com". www.image-entertainment.com. Archived from the original on 29 September 2011. Retrieved 26 April 2018. Sammon, P. M., Conan the Phenomenon, Dark Horse Books, 2013. "The Hall of the Dead"
"The Snout in the Dark"
"The Curse of the Monolith"
"Death-Song of Conan the Cimmerian"
"The Gem in the Tower"
"The Lair of the Ice Worm"
"The People of the Summit"
"The Thing in the Crypt"
"The Witch of the Mists"
This page was last edited on 28 March 2019, at 01:40 (UTC).